THIS IS AN EARLY ONE, LIKELY 1830'S OR EARLIER!! 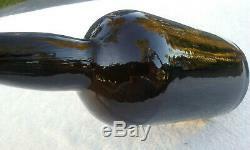 The term black glass refers to a group of early free blown bottles. 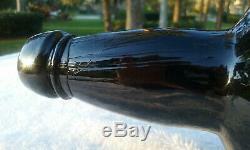 These bottles are not actually black but rather range from olive green to dark brown. Iron slag was added to the raw materials to produce the Olive green and dark colors collectively known as Black Glass. 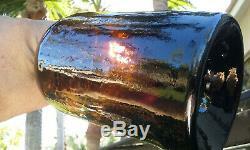 Its best to see these bottles true color by holding it up to a light source. 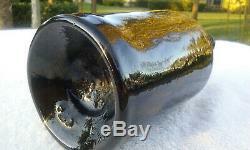 Black glass bottles range in age from approximately 1690 to the 1860s. 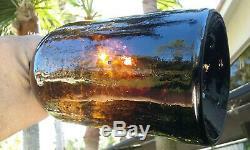 The dark color protected the bottles contents from harmful ultraviolet rays. Onion shaped bottles were made between 1690 and 1730. Mallet and Bell shaped bottles were made between 1730 and 1770. 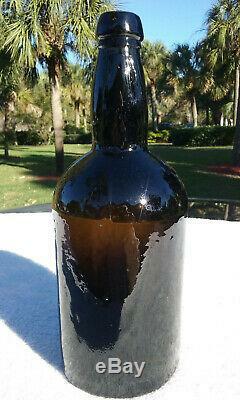 Squat shaped bottles like this beauty were made between 1770 and the 1860s. 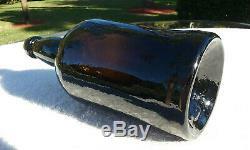 This beautiful crude black glass bottle was blown in a three piece mold and is made of thick dark black glass. 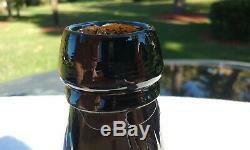 It is 9 1/2" tall and 3 3/4" in diameter and has no damage! It has a gloppy applied lip and extreme twisted stretch lines on the neck. The bottom is a "mess" with crudeness! Has everything you could want in an old crude bottle! 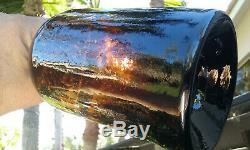 This is a beautiful antique bottle! It looks amazing in the sunlight as demonstrated in the photos!! It would make a great addition to anyone's collection! It would also make a fantastic accent piece for someone's bar or man cave! IF YOU HAVE BOUGHT FROM ME BEFORE, YOU KNOW THE QUALITY YOU WILL GET! Only, not a penny more. Please see my other items. 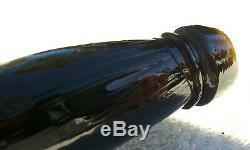 The item "1770-1830'S QUART SIZE ANTIQUE BLACK GLASS BOTTLE! SUPER" is in sale since Thursday, February 7, 2019. 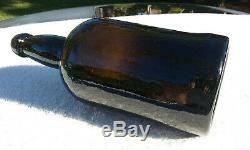 This item is in the category "Collectibles\Bottles & Insulators\Bottles\Antique (Pre-1900)\Mineral Waters". 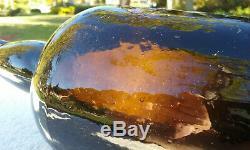 The seller is "jlftlaud" and is located in Pompano Beach, Florida. This item can be shipped to United States.